The following is a guest post on Our Oakland by Dave Cambell. Besides being the Program Director of the East Bay Bicycle Coalition (ebbc.org) and an avid cyclist, he's a Georgia boy who loves a wide variety of food, none more than good Q! While perhaps not as close to the heart as moles and their role in honoring the dead in Mexican culture, southern barbecue is very much cherished grub and revered across a vast swath of lower Americana. I can't think of another food that is as festive or as competitive in the hearts and minds of those who enjoy it. I know cause I grew up in Georgia, ate the stuff relentlessly as a kid, still cook it myself, and have two younger brothers who are competitive barbecue aficionados. Living now in California, I yearn for the stuff. I'm no expert for sure, but I have my favorite style and I am always ready to enjoy the offerings of any local barbecue joint, as long as it's quality and as long as they serve me a pulled pork sandwich. Fortunately, I can do this in a lot more places now because the deep south's culinary gift to the world has finally arrived. For years I considered the best barbecue restaurant to be Great American Barbecue, just across the High Street bridge in Alameda. It's a St. Louis-style barbecue joint that smokes a ton of ribs and serves pulled pork. I could chide them for using the term "artisan barbecue," which no one should ever have to do, since barbecue by definition is "artisan." That said, their sauces are familiar to west coast barbecue fans, a savory and sweet molasses–good, but the sauce can overwhelm the meat and there's a spicy, tangy richness that's missing. Same goes for Flint's BBQ in East Oakland, which is hefty and hearty, and Looney's BBQ and Everett & Jones, too. All serve saucy ribs and other good sweet and savory barbecue, but no yummy pulled pork sandwiches to remind me of home, all due to their preference for sweet over sour. And therein lies the secret to good barbecue—vinegar, and lots of it! Deep south barbecue is pork and vinegar. If you're from Carolina, that’s about all it is. In Georgia, we are happy to add some tomatoes to the sauce, but not too much. My recipe is about 1:1 vinegar to tomato sauce, with apple juice as the sweetener, by the way. It makes for a pulled pork sandwich anyone can enjoy. However, improving upon rich southern cooking traditions should be encouraged as should experimentation, something California cooks are always ready to do. Unfortunately, many restaurants try to do this by offering up a pulled pork sandwich as the 'special of the day.' Don't ever order one of these—I can't tell you how many times my heart's been broken. If you're not in a barbecue joint, order something else. Mind you, some places do make great barbecue pork and ribs, too, such as Chop Bar in Jack London, but theirs is not a barbecue joint and their sauce is all sweet molasses. It's good, but the experience is different. Similarly, the food truck Boffo Cart serves a wonderful, gourmet pulled pork that melts in your mouth, but it's not southern style and it's not in a sandwich. What's a lover of deep south pulled pork sandwiches to do? 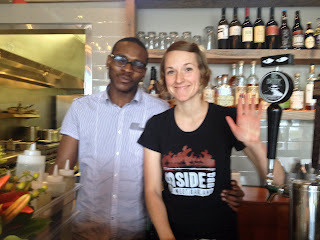 Come to Bside BBQ. They have been around longer than I realized and do two things particularly well: smoke their meats and pair them with great beverages. Their pulled pork sandwich with the Carolina sauce is really good. Pair it with the Thelonious Belgium Ale and life don't get much better. You can take me to task cause their pulled pork would never win a barbecue competition, other than maybe the "anything goes” category, but that's only cause traditions die hard in the south. It's pork, it's vinegar, it's a sandwich, and it's fabulous. They do cheat a bit at Bside, by having gone to some fancy schmancy cooking school in Paris–Le Cordon something or other, but boy does it work. I'm split on the decor and ambiance of Bside BBQ. Its classiness is top notch, but the pristine feel can interfere with the irregular down home experience I seek while chewing on threads of pulled pork. This is no roadside barbecue joint. Still, I have nothing against fine beer, wines and spirits and I reckon there is no reason these things can't be combined with a classy barbecue experience. Whether you seek good barbecue or good drinks, I recommend this place highly. For a slightly more authentic feel, try Smoke Berkeley. Their pulled pork sandwich has the peppery taste that most reminds me of Georgia barbecue. Maybe it's something in the crispy bits of outer pork layers. I don't know, but I like it. The kitchen is somewhat disorganized, like many a good roadside barbecue joint, but they eventually get you a full plate of food and their pies are so good that it seems like they specialize more in them than cooking meats. The place is also located right next to a car wash service, which is so southern. Overall, Smoke has a nice, simple authenticity to it. I approve. I also want to give kudos for Smoke Berkeley serving their sandwich on an Acme Bakery bun and even bigger kudos to Bside BBQ for using Semifreddie's kaiser bun. Why don't all restaurants take advantage of the amazing bakeries we have in the East Bay? While Acme Bakery is my favorite in general, I have to say Semifreddie's does the most for a pulled pork sandwich—it nicely holds the meat together on the bun, while adding just a bit of fresh crunchiness. On this note, I also want to give props to Actual Cafe for experimenting with an arepa corn bun for its pork sandwich. It's a promising combination. PhatMatt's BBQ on Telegraph is worth a trip, too. They'll serve you a 'North Carolina' pulled pork sandwich, but it's more like Kansas City in my opinion—good, but not vinegary enough for my taste and they tend to overdue it on the sauce. One thing I love is that PhatMatt's positions their smoker right behind the counter. You can see it right there, although you can't see the meats inside. This adds to the ambiance of the place and makes it easier to smell the wonderful aromas. You can also get a beer with your sandwich here and watch the ballgame, which is not something you could ever do at a barbecue joint in the deep South. Just ask them to put the sauce on the side, and enjoy! 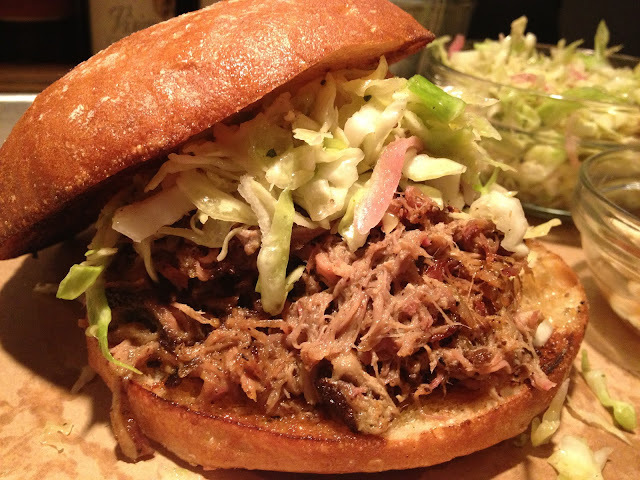 Can the pulled pork sandwiches of these local establishments be improved upon? Yeah. Smoke Berkeley could smoke their meats more and Bside still chops their pork—it's called 'pulled' for a reason, y'all. I'm still not sure the ultimate bun has been discovered for the pulled pork sandwich, but Semi's is the best so far. And none of these places dabbles in barbecue theater, which is one thing all self-respecting southern roadside barbecue joints thrive in doing. Walk into one of these, and you are overwhelmed at the sights and smells of racks and racks of meat smokin' in da smoker all right before your eyes. Pork butts, ribs, briskets, whole chickens tantalizing you long before you get to the order counter. In fact, you can smell these meats from a mile away, which is why people eat there so often. It isn't something you can experience on the streets of Oakland. So, I'm still seeking pulled pork nirvana but things are improving rapidly. Maybe I'll open up a restaurant, hmm? I'll probably hit BSide for their BBQ braised tofu nuggets, but that's hardly the same as regular BBQ. So I was happy to have Dave do this guest post—thanks, Dave! If you're interested in doing a guest post about Oakland, let me know. Dave, thanks so much for the fantastic and well-researched survey. As a fellow Georgian, I agree that pulled pork is the truest form of barbecue. I personally prefer less vinegar-based meat, served with delicious pickles. And I echo the pernicious habit of drowning meat in sauce and calling it flavor. Good ribs shouldn't need extra sauce. To see what I'm talking about, check out the Brick Pig House for what I think are the best ribs in the East Bay. Their sides and desserts are among the best as well, and it's across the street from Bushrod Park - picnic ready! Dave, Thanks so much for the great review and ratings at Smoke Berkeley. We appreciate your blog and the thoughtfulness behind it. Great pic with the Mexican Cornbread!